Chuckie’s® travel sick bags offer a simple, convenient way to manage sickness in the home or in transit. They are ideal for any passenger and are a compact, handy addition to any glove-box, hand bag or carry-on luggage. 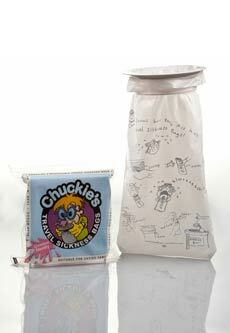 Discreet and easily disposed, Chuckie’s® sick bags are ideal for travel sickness. With a lockable seal, Chuckie’s® vomit bags provide a hygienic solution for sickness caused by migraines, gastro, morning sickness, travel sickness, motion sickness, car sickness, sea sickness and the side-effects of chemotherapy. Chuckie’s® Travel Sickness Bags offer all the superior qualities of the hospital-grade Embag® vomit bag in a convenient, easy to manage 3-pack and can be bought in quantities of 6, 12 or 18 packs. Can capture other things other than vomit! Chuckie’s® sick bags can also be used to capture urine, making them ideal for patients and travellers of all ages, who experience those stressful "I can’t hold on" moments!